Kamin, an internationally known comedian who trained actor Robert Downey Jr. for his Oscar-nominated role in "Chaplin," will pay homage to the silent-screen icon in "Funny Bones" at 7:30 p.m. Feb. 2. OSWEGO — Widely accepted as the premier mind on all things Charlie Chaplin, comedian Dan Kamin will take Tyler Hall’s Waterman Theatre back to vaudeville on Wednesday, Feb. 2, and Friday, Feb. 4, as part of SUNY Oswego’s performing arts series. Kamin, an internationally known comedian who trained actor Robert Downey Jr. for his Oscar-nominated role in “Chaplin,” will pay homage to the silent-screen icon in “Funny Bones” at 7:30 p.m. Feb. 2. 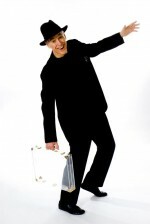 He will return at 7:30 p.m. Feb. 4 for “Comedy in Motion,” showcasing his new age of vaudeville and hilariously “exposing” the secrets of magicians in a guided tour of the performing arts. The comedian, who will be in residence for a weeklong series of events and appearances around the city and campus, began his career humbly, performing as a birthday party magician at age 12. To date, he has toured throughout America and performed “Comedy Concertos” with the symphonies of Cleveland, Atlanta, Malaysia, Singapore, Syracuse, Shanghai and Dallas. He will make an appearance with the Syracuse Symphony Orchestra this spring. In the book “Charlie Chaplin’s One-Man Show,” Kamin reveals the secrets of Chaplin’s comic art. His new book, “The Comedy of Charlie Chaplin: Artistry in Motion,” updates the former and features an account of how he trained Downey for the 1992 film. SUNY Oswego’s Artswego, which runs the performing arts series, has worked with Kamin to schedule a week chock-full of appearances at area high schools, the Armory, the Newman Center, campus dining halls and even a Rotary luncheon. One of Kamin’s comic personas, Mr. Slomo will make his way — veerrry sloooooowly — around the West First Street Armory, Saturday, Feb. 5, during the kickoff event of Warm Up Oswego. Kamin will follow up as “The Pantomime Man” at 3 p.m. Feb. 5 at the McCrobie Building, 41 Lake St., in a performance sponsored by Artswego and the Children’s Board of Oswego. Other public appearances will include a talk titled “Dan Kamin on the Life and Times of Charlie Chaplin” at 12:40 p.m. Monday, Jan. 31, at the Campus Center auditorium, and a 7 p.m. Jan. 31 appearance at a “Human Response to Stress” class, also set for the Campus Center auditorium. Tickets for each of the performances are $15 ($12 for seniors 60 and older and SUNY Oswego faculty and staff; $7 for students). Tickets are available at all SUNY Oswego box office locations, online at http://tickets.oswego.edu or by calling 315-312-2141. Parking is free in campus lots on evenings and weekends. For more information on SUNY Oswego arts events, visit http://www.oswego.edu/arts.